The Bogus Blues Brothers, high energy rhythm 'n' blues tribute duo performing songs from the famous movie. Blues Brother Soul Sister, the most stunning mixture of blues and soul you're likely to hear. Formed in 1991, this tribute act have been much in demand ever since. 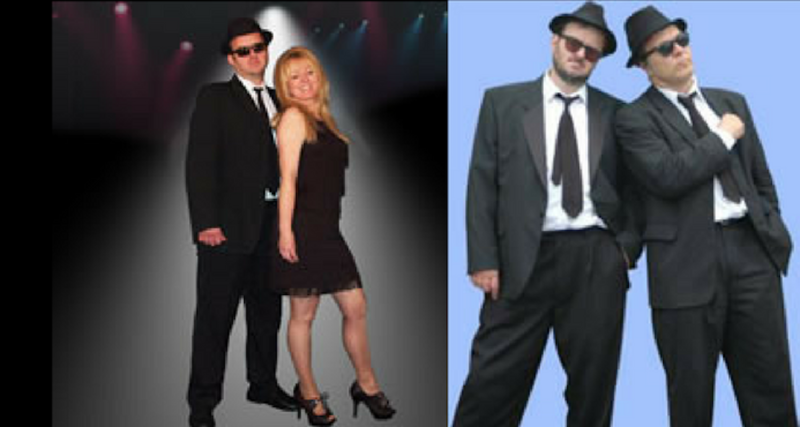 The ultimate rhythm ‘n’ blues experience, this ‘Jake and Elwood’ duo perform all your favourite Blues Brothers songs. Venues have included Grosvenor House, Royal Lancaster, Cafe Royal, Royal Hall in Harrogate, Bournemouth International Centre, all branches of the Armed Forces, Europe and New Orleans. They have worked for many major companies including ICL, ORACLE, Walkers Crisps, P&O and the John Lewis Partnership. The Bogus Blues Brothers normally perform as a duo but can also be hired as a solo act. They are a high energy, very professional and extremely entertaining act. So hang on to your hats and shades for the ULTIMATE rhythm ‘n’ blues experience. They’ll blow you away! Blues Brother, Soul Sister bring together some of the greatest blues and soul tunes of all time. Included in this unforgettable show are all the hits from The Blues Brothers film such as Gimmie Some Lovin’, Everybody Needs somebody to love, Minnie the Moocher and Sweet Home Chicago. In addition, they perform songs from the most soulful male and female singers of the era, Respect, Piece of My Heart, Soul Man and I Feel Good are just a few of the classics they can include to make this the most stunning mixture of blues and soul you’re likely to hear.